This is probably the most important and interesting podcast I’ve had the privilege of being part of: an expert panel on Recovering from Autoimmune and Neurodegenerative Diseases. The panel was arranged by Whitney Ross Gray of Nutrisclerosis, who has recovered from Multiple Sclerosis with an ancestral diet rich in animal foods. Terry Wahls, M.D., who has famously recovered from Multiple Sclerosis on an ancestral diet rich in plant foods, and is now leading a clinical trial studying ancestral diets as treatments for M.S. Sarah Ballantyne, Ph.D., who blogs at The Paleo Mom. Sarah suffered from an autoimmune disease, lichen planus, as well as other ailments, and healed them (and lost 120 pounds) with an ancestral diet. 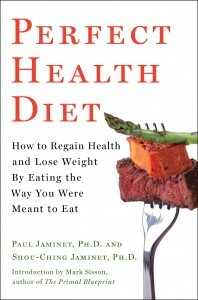 Paul Jaminet, Ph.D. I had a chronic disease with neurological symptoms that overlapped with M.S., but it turned out to be an infectious disease and cleared with antibiotics. However, this could not be diagnosed until after I’d made considerable progress addressing it through an ancestral diet, which became the Perfect Health Diet. Questions were solicited beforehand from patients suffering from autoimmune and neurodegenerative diseases, and in an hour and forty minutes we covered many fascinating topics. I think the combination of personal experience recovering from chronic diseases, and scientific and medical expertise, made for an exceptionally useful conversation. If you are interested in these diseases – or just in how to be healthy, since the methods that address these conditions are generally beneficial for anyone’s health – take a listen. My thanks to Whitney for organizing the discussion, Carl for hosting it, and Terry and Sarah for making a great panel. We started this series with a look at remarkably strong correlations between pork consumption and liver cirrhosis mortality, liver cancer, and multiple sclerosis (Pork: Did Leviticus 11:7 Have It Right?, Feb 8, 2012). In Part 2, we looked at omega-6 fats in industrial pork meat and toxins in processed pork products as possible causes (The Trouble with Pork, Part 2, Feb 15, 2012). The risk is higher for fresh pork than processed pork. Processed pork is generally cured or smoked, both steps that are anti-microbial. Eating fiber, which increases gut bacterial populations and enhances immune vigilance of the gut, is protective. The disease risk is specifically associated with two organs – the central nervous system (multiple sclerosis) and the liver (cirrhosis, hepatocellular carcinoma). Pathogens are more likely than other pork components to have tissue specificity. Our mission today is to try to track down the pathogen(s), and figure out how to minimize risk of infection. Scientists studying xenotransplantation – the transplantation of animal organs into a person to replace a failing organ – have had the best luck with pig organs. Pigs are easier to work with than primates, not dramatically different in size than humans, and their organs are less likely to provoke rejection than those of other mammals. This suggests a similarity of biology between pigs and humans. But biological similarity has its downsides. A large number of pathogens can infect both pigs and humans. More than any other animal, pigs pass pathogens to humans. Indeed, investigators have been surprised at how frequently pathogens pass back and forth. According to a new study (discussed at Aetiology) of the evolutionary history of methicillin-resistant Staphylococcus aureus (MRSA), S. aureus was passed to pigs by their human caretakers. In pigs, which are routinely given antibiotics by industrial food producers, S. aureus picked up resistance genes to tetracyclines and methicillins. The resulting antibiotic-resistant ST398 strain was passed back to humans. Pork tapeworm, Taenia solium, not only causes a parasitic infection of the intestines (the worm is typically 2 to 3 meters long) but also the larvae can infect the brain and muscles, causing the disease Cysticercosis which is a common cause of seizures. The roundworm Trichinella spiralis causes trichinosis. As in tapeworm infections, the mature worms are largely confined to the intestines where symptoms include nausea, heartburn, dyspepsia, diarrhea, and eosinophilia but larvae can migrate through the body, producing edema, muscle pain, fever, and weakness. The greatest danger is if the larvae reach the brain, where they can cause “serious neurological deficits (such as ataxia or respiratory paralysis), and even death.” Death results from a rare form of stroke, myocarditis, encephalitis, or pneumonia. E. coli, Salmonella, and Staphylococcus aureus . Yersinia enterocolitica, which causes gastroenteritis, is nearly always transmitted through pork. Brucella spp., the bacteria which cause brucellosis or undulant fever. Although all of these pathogens are potential concerns, I do not see strong specific links between the above pathogens and our three pork-associated diseases – liver cirrhosis, liver cancer, and multiple sclerosis. However, there is another pathogen capable of infecting humans from pork that is a strong candidate: hepatitis E virus (HEV). Hepatitis E was first observed in a 1955 outbreak in New Delhi, India. It generally produces an acute disease that lasts for several weeks; most victims recover with few symptoms, but in a few this acute illness progresses into a severe liver disease that can be fatal. About 2% of all infections lead to death from this acute liver disease; death rates are higher in pregnant women. HEV was rarely identified in industrialized countries, and the few reported cases of infection were usually in someone who had recently traveled to an endemic region. In the past few years this pattern has changed, as cases of endemic or autochthonous hepatitis E have been diagnosed with increasing frequency in individuals who have not traveled abroad…. Historically, China and Japan did not raise cattle for food and pigs have been the major source of meat. Even today in southern China, pigs are often kept in the yards of homes, and close contact between pigs and humans facilitates zoonotic transmission. Can humans get infected by eating pork products? It now seems clear that the answer is yes. As hepatitis E concentrates in the liver in both pigs and humans, swine livers were the natural place to test for hepatitis E presence, and probably the riskiest part of the pig to eat. Acute or recent HEV infection, defined by detection of anti-HEV immunoglobulin M antibodies and/or HEV RNA, was observed in 7 of 13 individuals who ate raw figatellu and 0 of 5 individuals who did not eat raw figatellu (P=.041). Moreover, HEV RNA of genotype 3 was recovered from 7 of 12 figatelli purchased in supermarkets, and statistically significant genetic links were found between these sequences and those recovered from patients who ate raw figatellu…. The titer of hepatitis E viruses in the supermarket sausage reached as high as a million copies per slice. This data suggests that a majority of figatellu in French supermarkets carries hepatitis E virus, and that a majority of people who eat figatellu acquire hepatitis E infections. Does Cooking Inactivate the Viruses? What level of cooking is needed to inactivate the virus? Since scientists don’t have the funding or facilities to see if feeding cooked, cured, or smoked pork to primates or pigs gives them hepatitis E, they have no way of verifying that cooked, cured, or smoked pork is free of HEV. In test tube experiments, HEV was still viable and infectious after cooking for 1 hour at 56°C, the temperature of rare to medium-cooked meat. About 80% of viruses were inactivated after an hour at 60°C, and an hour at 70°C probably eliminates the viruses. So: to avoid HEV infection, it’s best to avoid pork liver, intestines, or blood, or products made from them such as sausage; other cuts should be carefully rinsed of all blood and then cooked thoroughly to a temperature of at least 70°C. Simmering in near-boiling water for an hour should be sufficient. The most dangerous pork product is likely to be sausage, which often uses pork liver meat, and traditionally uses pig intestines as the casing. It may also contain traces of pig blood. Pig blood pudding, a traditional Chinese dish, should also be avoided. Hepatitis E was discovered as a cause of acute liver disease. But what about chronic diseases like alcoholic cirrhosis and liver cancer? Is there really evidence linking it to these diseases? First, studies of organ-transplant recipients who contracted hepatitis E from their donors have shown that HEV seems to establish chronic infections in at least 58% of infected persons. When anti-HEV antibodies exist, generally active viral RNA is present too. So the virus is persistent. Hepatitis B and hepatitis C viruses are known causes of hepatocellular carcinoma. What about HEV? If there were few studies linking HEV to cirrhosis, there are even fewer investigating its relationship to HCC. There have been no studies searching for a specific link between HEV and multiple sclerosis. If a hepatitis virus is causing MS in humans, we would expect MS patients to have high rates of liver disease. Indeed, there is a correlation. Pork can carry many pathogens; perhaps hepatitis E virus is not the MS-causing pathogen. I don’t see obvious candidates however. Perhaps herpes viruses would be most likely. One of the human pathogens likely to be causal for MS is Epstein-Barr virus, also known as human herpes virus 4 (HHV-4). It causes mononucleosis but establishes persistent infections and is associated with a number of diseases, including lymphomas, MS, lupus, and rheumatoid arthritis. There is a strong association between pork consumption and liver cirrhosis mortality, liver cancer, and multiple sclerosis. It seems likely that the association, if it is real, is mediated by a pathogen. The most likely pathogen in the case of the liver diseases is hepatitis E virus. In MS, the pathogen remains unknown, but is likely to be a virus. Hepatitis E virus is not destroyed by casual cooking, smoking, or curing. It appears that meat must reach temperatures of 70ºC (160ºF) before viruses are inactivated; and it is possible that meat must remain at that temperature for some time, perhaps as long as an hour. Rare or medium cooked pork could contain active viruses. Hepatitis E viruses are most abundant in liver, intestine, and blood. Pork products containing these parts, such as sausage, may be best avoided. Meat from parts of the pig with low viral titers, such as pork ribs or pork bellies, are likely to be safe to eat as long as they are well cooked. Be sure to wash the meat of all blood before cooking, and to cook thoroughly. The Trouble With Pork, Part 3: Pathogens, Feb 22, 2012. Purdy MA, Khudyakov YE. Evolutionary history and population dynamics of hepatitis E virus. PLoS One. 2010 Dec 17;5(12):e14376. http://pmid.us/21203540. Purdy MA, Khudyakov YE. The molecular epidemiology of hepatitis E virus infection. Virus Res. 2011 Oct;161(1):31-9. http://pmid.us/21600939. Satou K, Nishiura H. Transmission dynamics of hepatitis E among swine: potential impact upon human infection. BMC Vet Res. 2007 May 10;3:9. http://pmid.us/17493260. Kaba M et al. Frequent transmission of hepatitis E virus among piglets in farms in Southern France. J Med Virol. 2009 Oct;81(10):1750-9. http://pmid.us/19697419. Bouquet J et al. Close similarity between sequences of hepatitis E virus recovered from humans and swine, France, 2008-2009. Emerg Infect Dis. 2011 Nov;17(11):2018-25. http://pmid.us/22099089. Colson P et al. Pig liver sausage as a source of hepatitis E virus transmission to humans. J Infect Dis. 2010 Sep 15;202(6):825-34. http://pmid.us/20695796. Purcell RH, Emerson SU. Hidden danger: the raw facts about hepatitis E virus. J Infect Dis. 2010 Sep 15;202(6):819-21. http://pmid.us/20695795. Purcell RH, Emerson SU. Hepatitis E: an emerging awareness of an old disease. J Hepatol. 2008 Mar;48(3):494-503. http://pmid.us/18192058. Emerson SU et al. Thermal stability of hepatitis E virus. J Infect Dis. 2005 Sep 1;192(5):930-3. http://pmid.us/16088844. Legrand-Abravanel F et al. Characteristics of autochthonous hepatitis E virus infection in solid-organ transplant recipients in France. J Infect Dis. 2010 Sep 15;202(6):835-44. http://pmid.us/20695798. Halac U et al. Cirrhosis due to Chronic Hepatitis E Infection in a Child Post-Bone Marrow Transplant. J Pediatr. 2012 Feb 15. [Epub ahead of print] http://pmid.us/22341950. Jardi R et al. HIV, HEV and cirrhosis: evidence of a possible link from eastern Spain. HIV Med. 2012 Jan 18. http://pmid.us/22257075. El Sayed Zaki M, Othman W. Role of hepatitis E infection in acute on chronic liver failure in Egyptian patients. Liver Int. 2011 Aug;31(7):1001-5. http://pmid.us/21733089. Tao P et al. Associated factors in modulating aflatoxin B1-albumin adduct level in three Chinese populations. Dig Dis Sci. 2005 Mar;50(3):525-32. http://pmid.us/15810636. Yuan JM et al. Synergism of alcohol, diabetes, and viral hepatitis on the risk of hepatocellular carcinoma in blacks and whites in the U.S. Cancer. 2004 Sep 1;101(5):1009-17. http://pmid.us/15329910. Pachner AR. Experimental models of multiple sclerosis. Curr Opin Neurol. 2011 Jun;24(3):291-9. http://pmid.us/21519255. Carbajal KS et al. Surgical transplantation of mouse neural stem cells into the spinal cords of mice infected with neurotropic mouse hepatitis virus. J Vis Exp. 2011 Jul 10;(53). http://pmid.us/21775959. Tremlett H et al. Liver test abnormalities in multiple sclerosis: findings from placebo-treated patients. Neurology. 2006 Oct 10;67(7):1291-3. http://pmid.us/17030771. Robinson D Jr et al. Systemic sclerosis prevalence and comorbidities in the US, 2001-2002. Curr Med Res Opin. 2008 Apr;24(4):1157-66. http://pmid.us/18430269. A patient with primary biliary cirrhosis and multiple sclerosis. Am J Med. 1992 Apr;92(4):433-6. http://pmid.us/1558090. Kim JH et al. Infection of porcine cells with human herpesviruses. Transplant Proc. 2010 Jul-Aug;42(6):2134-7. http://pmid.us/20692426. Doucette K et al. Gene expression of porcine lymphotrophic herpesvirus-1 in miniature Swine with posttransplant lymphoproliferative disorder. Transplantation. 2007 Jan 15;83(1):87-90. http://pmid.us/17220799. Pork: Did Leviticus 11:7 Have It Right? If we were to rank popular meats by their healthfulness, the order would be (1) fish and shellfish, (2) ruminants (beef, lamb, goat), and (3) birds (duck, chicken, turkey). In last place would be pork. Pork consumption has a strong epidemiological association with cirrhosis of the liver. Startlingly, pork may be even more strongly associated with alcoholic cirrhosis than alcohol itself! The evidence was summarized by Francis Bridges in a recent (2009) paper , building on earlier work by Nanji and French . A relation between pork consumption and cirrhosis of the liver is apparent across countries and has been consistently maintained for at least 40 years. The correlation coefficient of 0.83 is extremely high – rarely seen in epidemiology. Correlation coefficients range from -1.0 to 1.0, and a coefficient of 1.0 would indicate that cirrhosis mortality was strictly proportional to pork consumption. The very low p-value confirms the statistical association. The correlation coefficient is lower than for pork consumption. [A]nalysis of data from 17 countries indicated that diets high in cholesterol and saturated fat protected (i.e., inversely correlated) against alcoholic cirrhosis while polyunsaturated fats promoted (positively correlated) cirrhosis . Beef is high in saturated fat, low in polyunsaturated fat. Pork is relatively high in polyunsaturated fat. If the fat composition is playing a role, perhaps it is not that surprising that pork is more strongly related to cirrhosis than alcohol. Either fructose or alcohol can react with polyunsaturated fat to produce liver disease. Sugar consumption, for example in soft drinks, may be just as likely to combine with pork to cause a cirrhotic liver as alcohol. But no other common dietary component can substitute for the role of polyunsaturated fat in causing liver disease. But fat composition is hardly likely to be the sole issue with pork. Most polyunsaturated fats in modern diets are derived from vegetable oils, not pork. It seems that there must be something else in pork besides polyunsaturated fat that is causing liver disease. We would expect that if pork can cause liver cirrhosis it will also promote liver cancer, since injured and inflamed tissues are more likely to become cancerous. 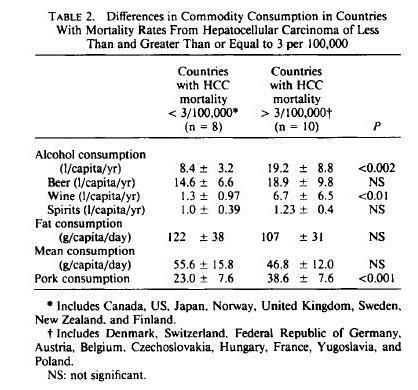 The authors investigated the possibility that dietary fat, meat, beef, and pork consumption might be factors that would, in addition to alcohol, correlate with mortality from hepatocellular carcinoma (HCC) in different countries…. 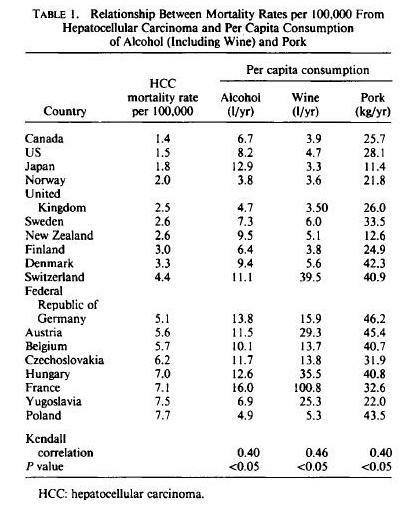 The correlation between HCC and alcohol was 0.40 (p < 0.05); that with pork consumption was also 0.40 (p < 0.05). There was no correlation with total fat meat, beef, and cigarette and tobacco consumption. As noted earlier, a correlation coefficient of 0.87 is extremely high, and a p-value below 0.001 also shows a very strong relationship. MS is much more likely to befall pork eaters. 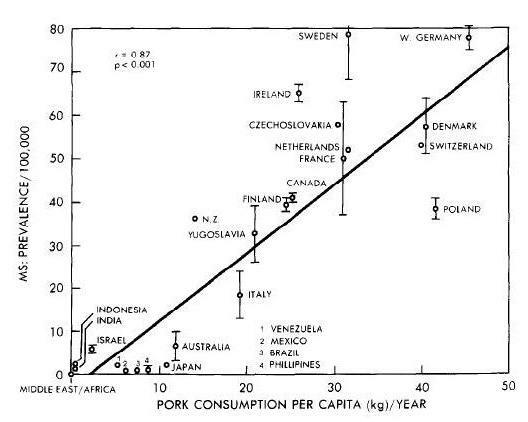 Such a strong correlation makes it look like pork, or something found in pork, is the cause of MS. When … quantitative data are taken into account, and a combined factor “smoked meat” or “smoked pork” is formed, the association is very high throughout. This factor is also compatible with the high risk of multiple sclerosis in Scotland and particularly in the Orkney and Shetland Islands and with the only transitorily high incidence in the Faroe Islands , whereas coffee can hardly explain both epidemiological features. There are remarkably strong correlations between pork consumption and liver disease, liver cancer, and multiple sclerosis. What can be behind those relationships? The relatively high omega-6 fat content of pork may be a contributing factor, but it can’t be the whole story. It seems there is something else in pork that makes pork consumption risky. What is it about pork that is so dangerous, and what does it mean for our dietary advice? That will be the topic of my next post. Bridges FS. Relationship between dietary beef, fat, and pork and alcoholic cirrhosis. Int J Environ Res Public Health. 2009 Sep;6(9):2417-25. http://pmid.us/19826553. Nanji AA, French SW. Relationship between pork consumption and cirrhosis. Lancet. 1985 Mar 23;1(8430):681-3. http://pmid.us/2858627. Nanji AA, French SW. Hepatocellular carcinoma. Relationship to wine and pork consumption. Cancer. 1985 Dec 1;56(11):2711-2. http://pmid.us/2996744. Nanji AA, Narod S. Multiple sclerosis, latitude and dietary fat: is pork the missing link? Med Hypotheses. 1986 Jul;20(3):279-82. http://pmid.us/3638477. Lauer K. The food pattern in geographical relation to the risk of multiple sclerosis in the Mediterranean and Near East region. J Epidemiol Community Health. 1991 Sep;45(3):251-2. http://pmid.us/1757770. Lauer K. Dietary changes in relation to multiple sclerosis in the Faroe Islands: an evaluation of literary sources. Neuroepidemiology. 1989;8(4):200-6. http://pmid.us/2755551. Lauer K. Environmental nitrophenols and autoimmunity. Mol Immunol. 1990 Jul;27(7):697-8. http://pmid.us/2395440. Nanji AA, French SW. Dietary factors and alcoholic cirrhosis. Alcohol Clin Exp Res. 1986 Jun;10(3):271-3. http://pmid.us/3526949. In Tuesday’s comments, Kriss brought up Paul Ewald, father of the “Ewald hypothesis.” (Also brought up by Dennis Mangan here.) Ewald did some of his work in collaboration with Gregory Cochran, who may be familiar to many for his appearances on blogs (notably at Gene Expression) and for his recent book The 10,000-Year Explosion. Darwinian laws have led Ewald to a new theory: that diseases we have long ascribed to genetic or environmental factors — including some forms of heart disease, cancer, and mental illness — are in many cases actually caused by infections. Regular readers won’t be surprised to hear that we wholeheartedly endorse the Ewald hypothesis. We believe that nearly all diseases are caused by infections and bad diet. Malnourishing, toxin-rich diets impair immune function and create vulnerability to infectious disease. Ewald’s reasoning goes as follows. Quotations are from the Atlantic essay. As noted, the background mutation rate — the ratate which a gene spontaneously mutates — is typically about one in 50,000 to one in 100,000. Not surprisingly, genetic diseases that are severely fitness-impairing (for example, achondroplastic dwarfism) tend to have roughly the same odds, depending on the gene. Diseases that are fitness-impairing and reach higher prevalence – and this includes nearly all major diseases – must have a cause other than genetic mutations. Germs, on the other hand, are plausible candidates as causes for disease. Germs can benefit from doing us harm. At a minimum, they would like to modify human functioning in order to make us better hosts for themselves — by suppressing immune function, for instance. Also, they wish to induce behaviors that help them spread to new hosts – like sneezing, coughing, diarrhea, or sexual promiscuity. This means that germs quickly optimize their disease characteristics through natural selection. For example, virulence, or the severity of the disease that a pathogen causes, is rapidly optimized. One factor determining virulence is how easily the organism can spread to a new host. If the organism can spread easily, there’s little cost to harming the current host, and microbes produce severe disease. If it’s hard to spread, on the other hand, organisms will be mild and peaceable toward their hosts. It pays to keep their hosts alive and healthy. The dots on Saunders’s graphs made it plain that cholera strains are virulent in Guatemala, where the water is bad, and mild in Chile, where water quality is good. “The Chilean data show how quickly it can become mild in response to different selective pressures,” Ewald explained…. Strains of the cholera agent isolated from Texas and Louisiana produce such small amounts of toxin that almost no one who is infected with them will come down with cholera. Of the top forty fitness-antagonistic diseases on the list, thirty-three are known to be directly infectious and three are indirectly caused by infection; Cochran believes that the others will turn out to be infectious too. The most fitness-antagonistic diseases must be infectious, not genetic, Ewald and Cochran reason, because otherwise their frequency would have sunk to the level of random mutations. If this analysis were repeated today, the percentage would be still closer to 100%. More cancers are now known to be caused by viruses, and the links between microbes and cardiovascular disease, dementia, and multiple sclerosis are stronger than ever. I think Ewald and Cochran are correct in asserting that mental and neurological illnesses are especially likely to be infectious in origin. These illnesses tend to have a big impact on number of descendants, supporting the evolutionary argument for an infectious origin. And, due to their dependence on glucose, neurons are unusually susceptible to infections. From the fitness perspective, schizophrenia is a catastrophe. It is estimated that male schizophrenics have roughly half as many offspring as the general population has. Female schizophrenics have roughly 75 percent as many. Schizophrenia should therefore approach the level of a random mutation after many generations. I concur. Medical research should make much bigger investments in detecting, understanding the effects of, and developing treatments for human infections. Many existing lines of research, including many of the “autoimmune” and genetic hypotheses for disease origins, are not panning out, but continue to monopolize funding. In the last century, sewage and water treatment has cleaned up our water supply and removed sewage and water as a vector for disease transmission. 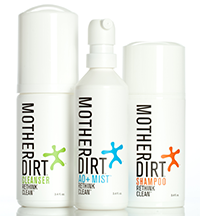 Hygienic methods, such as daily bathing and the use of soap, also tend to inhibit disease transmission. Just as cholera is an extremely mild constituent of gut flora in hygienic Texas, but creates acute disease in unclean Guatemala, so we can expect that germs that created acute disease in (unclean) 1900 will have evolved to create mild chronic infections in (hygienic) 2011. This is Jaminet’s corollary to the Ewald hypothesis: Microbes are evolving away from severe acute disease toward milder chronic disease. The focus of modern medicine on acute conditions, and its neglect of chronic conditions, adds to the selective pressures on microbes. Any pathogen that creates acute disease is subject to the full arsenal of modern antimicrobial drugs. But pathogens that create mild chronic disease are generally left untreated. Modern medicine has created a powerful selective pressure on pathogens to generate chronic illnesses that are just mild enough, and that resemble aging closely enough, to elude the attention and antimicrobial arsenal of medical doctors. Why No Dementia in Kitava? Staffan Lindeberg in the Kitava Study found no evidence of stroke, diabetes, dementia, heart disease, obesity, hypertension, or acne on Kitava. Why were these diseases absent? Partly due to the Kitavans’ excellent toxin-free diet, no doubt, but partly also due to an absence of the pathogens that cause these diseases. Why was there no multiple sclerosis in the Faeroe Islands until British troops were stationed there in World War II? Because the pathogen that causes MS was absent from the islands, until the Brits introduced it. Why has the incidence of chronic diseases increased tremendously in the last century? Partly due to longer-lived populations, but also, I believe, due to evolution of pathogens toward these diseases. I predict the incidence of chronic disease will increase further in decades to come; and we will gradually come to appreciate that nearly all forty year olds today are not fully healthy, but are mildly impaired by a collection of chronic infections. Fifty thousand years ago there were a few hundred thousand humans in the world. Today there are over 6 billion. If a pathogen today wants to adapt to a specific host, its best bet is to adapt to humans. And within humans, its best way to flourish is to develop a chronic infection that persists for many decades. The evolutionary arms race is not over. It has simply moved to a new field of battle. And medicine will have to evolve as the microbes do. The microbes are developing a new style of fighting. Medicine needs to shift its focus toward this rising threat of mild chronic diseases.